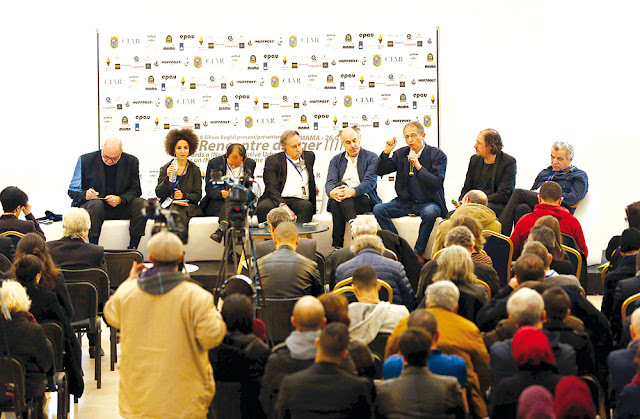 La Rencontre D'Alger ("Meeting in Algiers"): Towards a Disruptive (New) Urbanism, Panelist, January 26, 2019. Resilient New York: Sea levels are rising and the American metropolis is one of the most at risk. Through works already in place and projects for the future, we look at how the landscape of the coast is changing as its interface with the water is softened and it returns to some extent to its origins, leaving room for marshes, perennial plants and a new and varied fauna. Abitare, January, 2019. ONE THING IS OVERWHELMINGLY CLEAR FROM LISTENING TO LANDSCAPE ARCHITECTS advising New York City on planning and building for rising seas. Water will flow through the city. It always has, but there will be much more of it, overwhelming infrastructure systems. In 2012, Hurricane Sandy served as a warning, inundating low-lying areas along the 52 miles of waterfront. In the future, we would do better letting it flow, controlling it less, giving it gentler and a greater variety of ways to be absorbed by the city. Across Manhattan, Brooklyn, Queens, the Bronx, and Staten Island, the city is spending $20 billion on its OneNYC resiliency program. The future is all about wetlands, tidal landscapes, soft edges, and water retaining swales. This is true even where dense, booming condo developments install thousands of units of new housing on the shore. 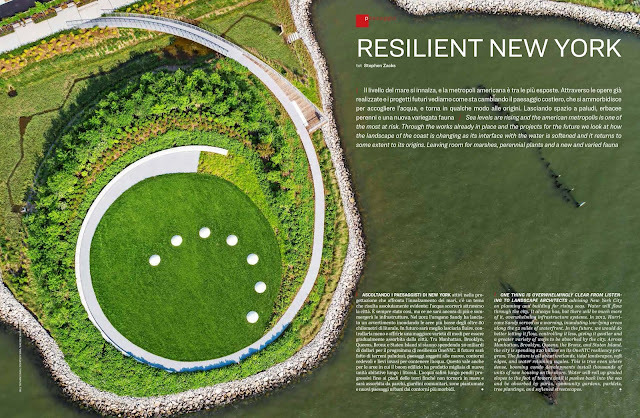 Water will roll up graded slopes to the foot of towers until it pushes back into the sea and be absorbed by parks, community gardens, parklets, tree plantings, and softened streetscapes. "Let’s be honest: Say you’re a single person making $55,000 a year, optimistically, doing OK, statistically, essentially what qualifies as the margins of low-to-moderate income in New York City. 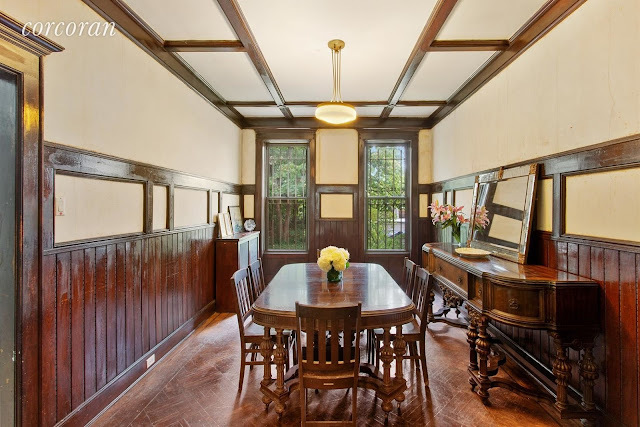 According to the traditional rent-to-income calculation, you don’t even qualify for this studio apartment at 2164 Caton Avenue in a neighborhood “safe to people with a reasonable amount of street smarts,” per the Google Brooklyn safety map. That means the landlord is going to ask you for a War and Peace-size file with all of your income, taxes, and reams of private information, then likely reject you as too poor for probably the lowest price apartment you can find within an hour’s subway ride of the places essential for your work and life. And you’re one of the people supposedly gentrifying the place. Oh, and by the way, for maintaining the 40 units in this building, the rentier landlord is bringing in a tidy $900,000 profit, according to PropertyShark. Blame the artists!" Other Voices, Other Worlds: Prompted by the dire ecological effects of business as usual, a number of artists and architects now embrace a “posthuman” worldview, crafting projects based on a decentralized, nonhierarchical unity of all species. 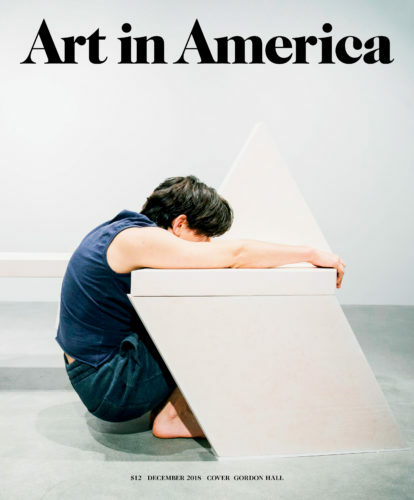 Art in America, Dec. 2018. ...most (if not all) the efforts of artists, activists, and scholars engaging with posthumanism confront the problem of incommensurability. These projects are not entirely reconcilable within existing legal and political frameworks. Yet it might make sense to see them, as Haraway does, as generative gestures that are not delegitimized by their contradictions. They are, for now, fitting projects for aesthetics: uses of the imagination to create more beautiful worlds. Does this park on the Red Square reshape Russia’s public space? Does this park on the Red Square reshape Russia’s public space? AC Architectural Creation, Oct. 23, 2018. 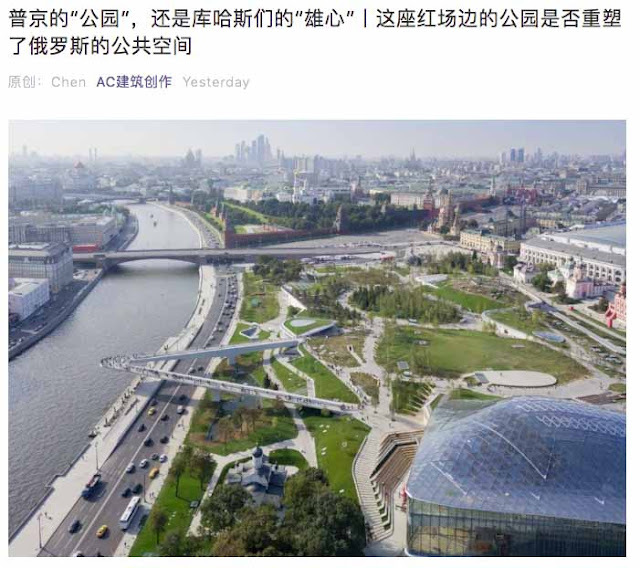 My article "Soft Power in Moscow" was translated by Yayun Dong of the landscape architecture firm Hargreaves Associates, then used as a reference text for a new article, reedited, reframed, and published in the Chinese online magazine AC Architectural Creation under the title "Does this park on the Red Square reshape Russia’s public space?" It covers Diller Scofidio + Renfro's Zaryadye Park and other Moscow urban design projects reflecting a view of Russia's government as a system that despite its faults is able to be influenced by public opinion and professional design work. "Introduction: Real Estate Show," in Changes on the Fly, ed. Matthias Mayer, Catalog to the exhibition series, Spor Klübü, Berlin, 2017. How do Berlin artists deal with the changes in their city, the changing living and work habits? Many are losing their studios because real estate owners are targeting higher rents and more lucrative contracts with new paying tenants. Enough new affordable studios are simply not available. Artworks done in the last few years is generally disposed of quickly, because space – even storage space – is not affordable. The nomadism of artists reaches its limits, because even in the outer districts of Berlin alternative real estate has already been taken. How does this external pressure manifest itself in the work of the artists? 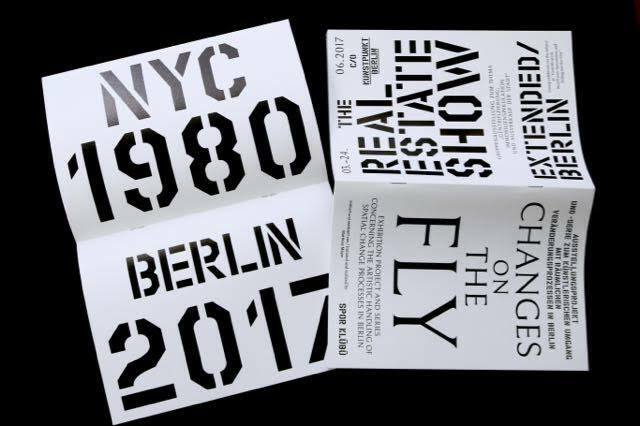 The exhibition series “Changes on the fly” started with an example from New York City in the early 1980’s. In New York’s speculator-eldorado Lower East Side, artists occupied a storefront at the beginning of the 80’s to stage an exhibition on the topic of real estate speculation titled “The Real Estate Show”. This was cleared shortly afterwards by the police. Documentation of that exhibition organized in cooperation with Becky Howland - provided an introduction to the series, followed by the group exhibition “The Real Estate Show Extended/Berlin” which refers to Berlin and a further four individual exhibitions with Berlin-based artists at the project space Spor Klübü. Waterfront Rising: In recent decades, New York's historically hardworking shoreline has transformed to redefine the city for the 21st century. 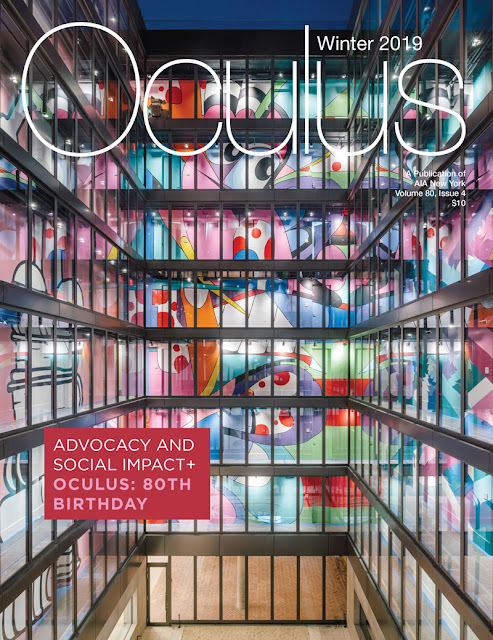 Oculus, Summer, 2018. Art, Architecture, and Capital Flows. 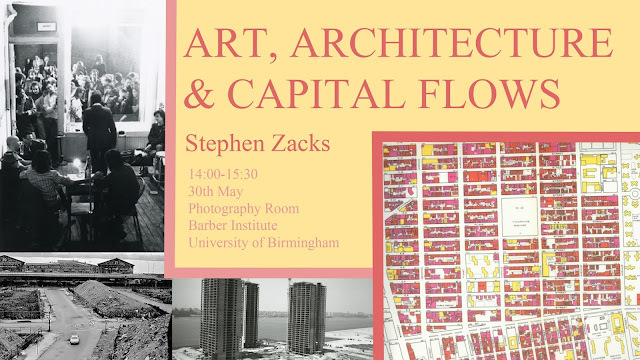 University of Birmingham, Barber Institute of Fine Arts, May 30. 2018. 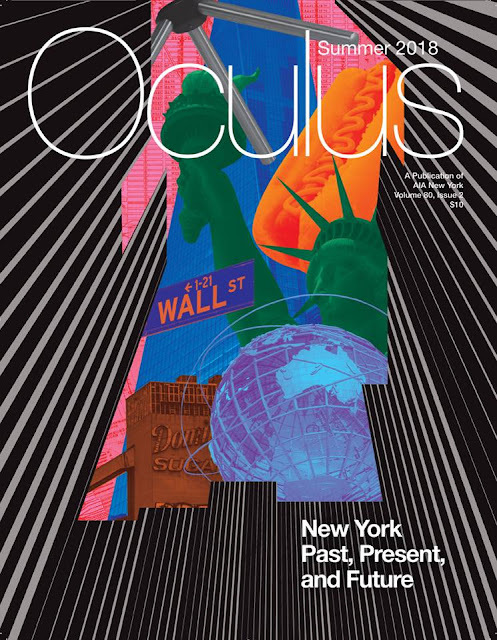 Based on seven years of research and more than 100 interviews with founders of institutions in Lower Manhattan from the 1960s through the 80s, this lecture re-examines the formation of artists' communities and generative aesthetic practices in New York City and their relation to capital formation and real estate development. Questioning the assumptions perpetuated by the formative example of SoHo in the 1970s, it brings into relief the planning and policy contexts and economic drivers that underpinned the transformation of New York City from the post-war era to today. Throughout this period, an argument emerged about the potential to think of culture as a form of embedded capital; the lecture looks at the limits of contemporary experiments in applying socially engaged design to intentionally reallocate resources in the absence of supportive state and local policies. 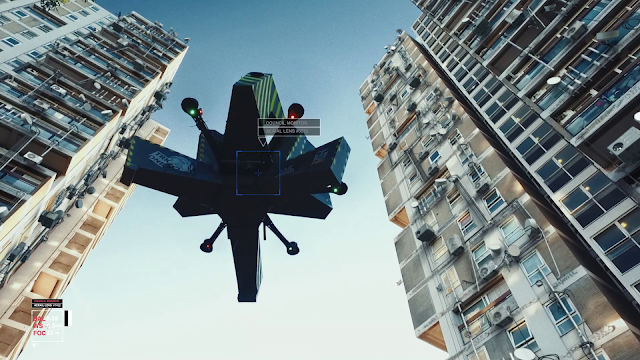 Robot Citizens: Architecture & Social Responsibility Now, Dimensions of Citizenship. US Pavilion, Venice Architecture Biennale, 2018. 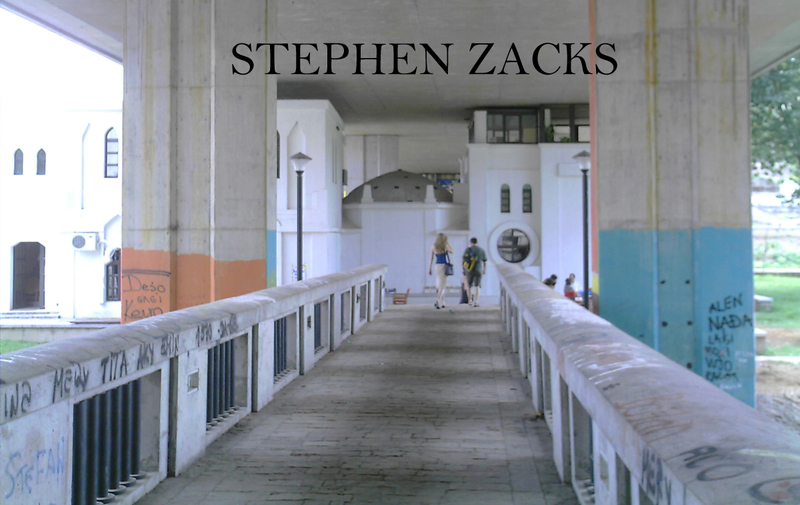 Vast technological infrastructures increasingly dominate contemporary life, calling into question traditional assumptions about public space, citizenship, and identity as coherent organizing ideas for a redemptive humanism. As our built-up environment becomes increasingly mediated and controlled by algorithms and the world’s ecology is permanently marked by economic production, must ideas like citizenship, cities, and social responsibility be replaced by a posthuman logic, and what would its implications be for collective action and the shared spaces we inhabit? A panel introduced by SCI-Arc Director Hernan Diaz Alonso and featuring Laura Kurgan of Center for Spatial Research, Charles Renfro of Diller Scofido + Renfro, architectural historian Marrikka Trotter of SCI-Arc, and Liam Young of Tomorrow’s Thoughts Today discusses the ethical questions facing the future of architecture and urbanism, moderated by architecture critic and curator Stephen Zacks. Robot Citizens is a partner program is organized by SCI-Arc.